I get quite a lot of reports of antisocial behaviour. Some people tell me they feel nervous going out at night because of yobbish behaviour. Others are fed up with the noise, puke and urine. Every now and again, we get spates of broken windows and other vandalism. Councillor Viv Parry and I, and town councillor Glen Ginger have been raising concerns about antisocial behaviour at the top of Corve Street for some months. Now action is being taken. CCTV cameras have an important role to play in monitoring hotspots of bad behaviour. Two new cameras are to be installed at the end of July. One will monitor the benches on Parkway outside the Library. The other will view the area of the Compasses towards the Bull Hotel. Hopefully when people know that they are being filmed, they will behave better. If not, the camera evidence will mean that we can identify the people involved. These cameras will only be in place for twelve weeks. Bronze Level Tasking– a multi-agency body that focuses on operational matters related to crime and disorder – will then decide is permanent cameras are justified. 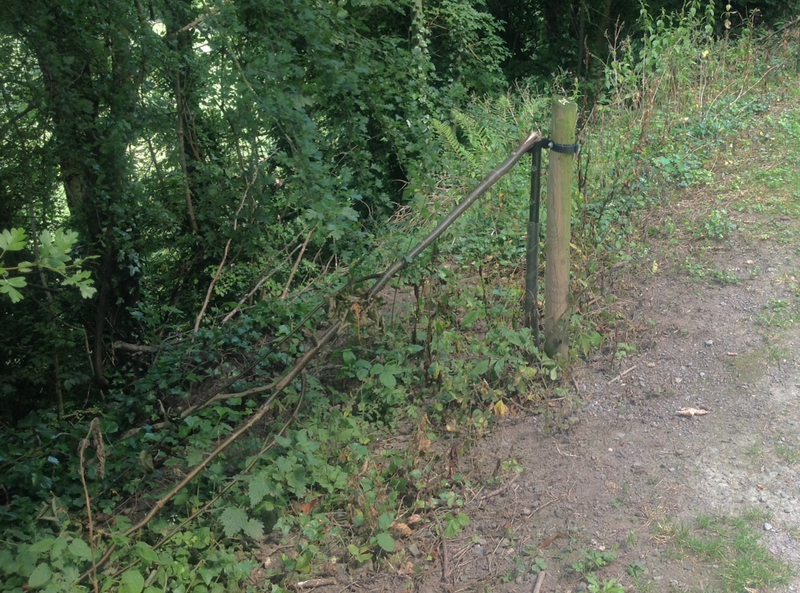 There are no cameras covering the embankments below the castle above the Teme. 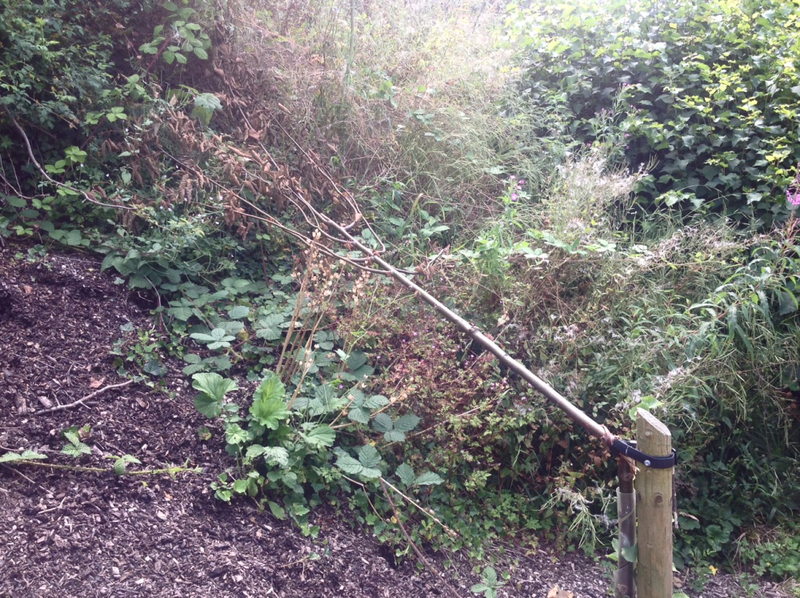 A few weeks back several saplings were snapped off. Mindless vandalism like this infuriates everyone. New signs are also going up around Ludlow advising people how to report antisocial behaviour. It’s an initiative by Shropshire and Ludlow councils to tackled issues like vandalism, fireworks, litter, noise and drug use. The A5 signs are being placed in many play areas, car parks and other public places. It doesn’t say on the sign but the phone service advertised is 24 hours, 7 days a week. The calls are also prioritised in those infernal telephone queues. It’s a shame there is no social media reporting mechanism for antisocial behaviour but I guess this will come with time. 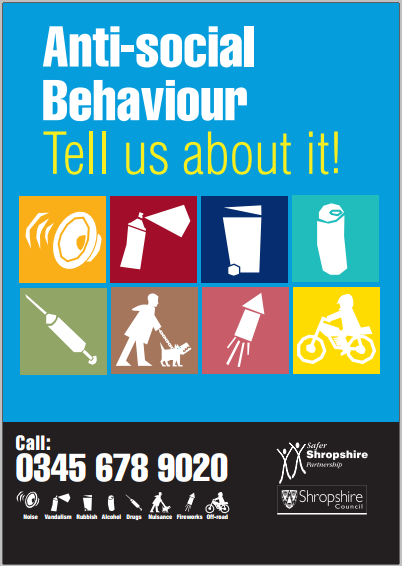 You can report antisocial behaviour by ringing Shropshire Council on 0345 678 9020. You can also report online. There is a lot of work going on to address the problems some young people are facing and the disruption a small number of them cause. We have a very active Ludlow Youth Partnership, a Ludlow Community Alcohol Partnership, both chaired by fellow councillor Tracey Huffer, and an excellent Youth Centre. We held an excellent Youth Festival last week, despite the rain. In the future, the Local Joint Committee may play a bigger role in coordinating youth support. It’s not the formal structures that are important, it’s the people who work so hard to help young people. We have a great support team in Ludlow and I take my hat off to them.